It’s the first of advent today, so of course I made glögg. 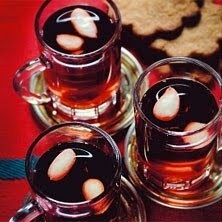 Glögg is kind of like Swedish mulled wine. Except it tastes better and smells better. And no, it is absolutely NOT like the syrupy concoction they sell and sometimes serve at IKEA. That is not glögg. If I was in Sweden I’d just buy some bottles of glögg at the liquor store. But I’m not in Sweden. So over the years I’ve started making my own and I’ve gotten quite good at it, if I say so myself. Because if there is one thing I HAVE to have this time of year, it’s glögg. Taste it to adjust the sweetness. Heat it up without letting it simmer or boil and serve it in small cups with some raisins and chopped blanched almonds. The smell is almost the best thing about it. Almost. Next Post My flash fiction collection DARK FLASH 2 is now available!